Before I continue my zealous advocacy for radian measure, I should acknowledge that other than Feynman, I have never seen anyone use radians while making an every-day casual reference to the size of an angle. Degree measure is more convenient here because it is more familiar. Familiarity is not a bad thing. Besides, even students who have completed a year of trigonometry and who have memorized their way around the unit circle (π/6, π/4, π/3, π/2…) often struggle when I ask them to draw an angle that is approximately one radian. Try it yourself to see what I mean. Draw an angle of approximately one radian. But no fair converting! Though you could use the fact that π radians = 180 degrees to figure out what one radian is in degrees, that would evade the purpose of the question. The goal is to develop an intuitive feel for radian measure. So try to draw a radian without “thinking in degrees”. Early in the school year, students often ask “how much is a kilogram”? I know they want an answer that relates kilograms to pounds. But that kind of conversion factor doesn’t help develop intuitive feel. I prefer to point out that one kilogram is the mass of a liter of water. And since all of my students walk around carrying half-liter bottles of water at all times (the hydration generation), they all know exactly what a half-kilogram feels like. So how do we draw that one-radian angle? 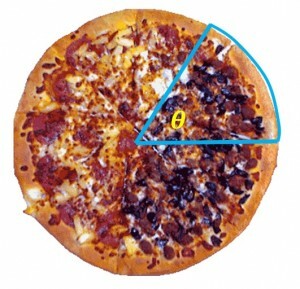 Let’s rephrase that question in edible terms: draw a slice of pizza with crust-length equal to the radius! Since the arc length is equal to the radius, it must be that the ratio is 1:1. That makes the central angle one radian. That’s the angle Feynman was using to describe his errant throw. Now let’s get rid of the pizza and just look at the angle. Suppose you increase that angle just a little to pull the crust into a straight line (without changing its length). You would now have an equilateral triangle. That tells us something interesting: one radian is a little less than the angle of an equilateral triangle. And since we already knew that the three of the angles of an equilateral triangle (in fact,of any triangle) add up to a straight line, it must take a little more than 3 radians to also add up to a straight line. How much more? You already know that too: π radians = 180 degrees. Right. But maybe now you have a little more of that radian feeling. I found this on BusinessInsider.com in an article by Walter Hickey.